Bearing in mind that I’m going through it solo for my initial run, this is a single-player game with lag, server queues and no offline play. Goodbye flipping open the laptop on the train for a quick go and, for the moment, good luck playing at peak times. This has been written on at great length and much more authoritatively than I could manage, so I’m going to point you in the direction of Eurogamer’s arguments for and against this new approach, because what surprised me about these discordant articles is that I agree with both of them. 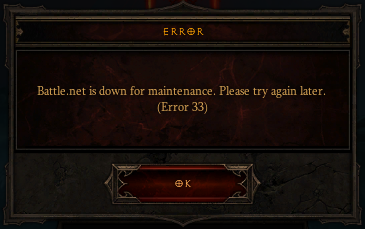 When you’re online, the connection’s reliable, Battle.net is running properly and you have no urge to venture outside somewhere without a good wi-fi signal, Diablo III’s infrastructure is magnificent. Log in on any computer, PC or Mac, and your characters are there. Make some progress or just throw a couple of things into the auction house and it’ll all be reflected on your computer at home when you fire the game up later. That’s how ‘the cloud’ is going to change gaming, and we’re starting to see it with cloud saving in Steam, Xbox Live and PSN. Throw in how always being online makes playing alone, playing with randoms and playing with friends one and the same and never more than a couple of clicks away and it’s a good advert for the natural progression of what we’ll see in the next-generation versions of our current online services, only available right now. It’s for these reasons that I’m giving it the benefit of the doubt. Blizzard is forging a new path here, and although it does a lot that needs to be done better, it’s a very respectable first attempt. When you can get on, that is.